The problem with portable televisions is simple. They’re either too small to be practical, or too bulky and fragile to really be portable. By contrast, projectors can conjure massive screens out of essentially any flat surface. Many are small enough to fit in a handbag or briefcase. But finding the video projector best suited for your needs begins with understanding your needs. 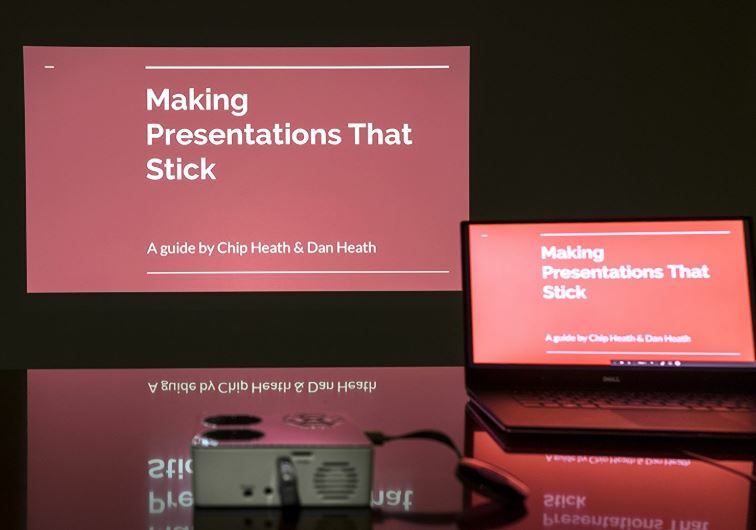 If you’re planning on using a portable projector for business presentations, you might want highly prioritize accurate colors and readable text. And if you’re just trying to take a screen with you on the road, you might be more interested in battery life, and how quickly you can set things up. Relative to its size, the AAXA P6 is stunningly powerful. It wasn’t long ago that a projector with similar power was the size of a desktop computer. Being somewhat small, the P6 makes is fairly portable as well. And while the P6 may be slightly biased towards professional use, it’s almost just as good for setting up in your home to watch movies. The AAXA P6 is uses a remarkably small 5 x 4.8 x 1.7-inch form factor, a build which resembles a thick measuring scale. Along the topside of the device, you’ll notice a pair of fan ports next to the modest onboard speakers. Along the backside of the device, you’ll find the VGA in, video in, on/off button, 3.5mm aux port, DC power input, and memory card ports. But perhaps the best place to start with the bulb. The AAXA P6 uses an LED bulb rated to last around 30,000 hours. To put that in perspective, you could watch a movie every day for the next four decades without replacement. Additionally, LEDs are great for keeping contrast and color levels steady as the bulb slowly degrades, so you don’t have to worry about the image going to hell before the bulb has run its full lifespan. Onboard you’ll find a 2-watt speaker which the manufacturer describes as powerful, but they’re everything you can expect of a 2-watt speaker crammed onto the side of a small projector. Their sound quality is about the same as you find on a small TV, which should prove passable for people who plan on using the full extent of the portability of the P6. But if you want to get more sound out of the AAXA P6, your best solution will be adding a portable speaker. In spite of its ridiculously small size, the P6 is built with a standard native resolution of 1080p. The LED-based bulb provides 600 lumens, which isn’t going to cut it for broadcasting in a well-lit room. But given more reasonable conditions, like a boardroom with the lights turned off, 600 lumens will perform admirably. The picture quality is sustained so well in large part because AAXA uses DLP LED technology, producing higher levels of brightness than comparably sized projectors. Fully extended, the AAXA P6 can be extended to projecting a massive 140” presentation. The first 100-inches or so look great even in moderately bright conditions. However, making it all the way out to 140” while retaining picture quality will require a darker space. In well-lit rooms, you’d be better off running the P6 in a smaller mode, up to its minimum size of 10-inches. Out of the gate, you’ll quickly notice the P6 is great at producing readable text, in large part due to its great support for high contrast black and whites. Fonts are easy to read as small as 9-point. And fonts even smaller than that may be readable depending on the quality of your vision. Color accuracy is largely the same. 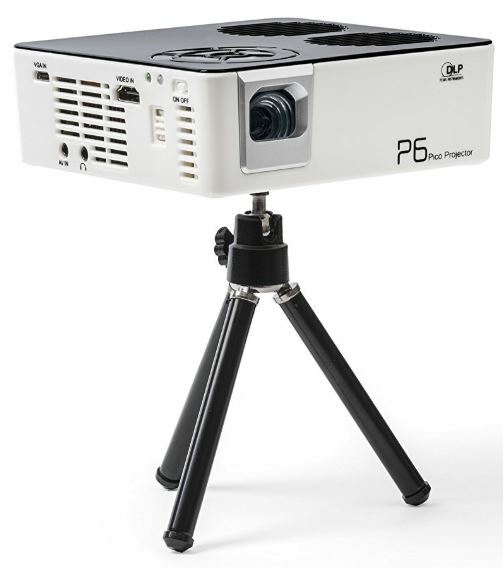 For PowerPoint presentation graphics, movies, and the like, the P6 provides more than enough accuracy. The Vibrant Color Technology boosts image quality to levels that are hard to believe relative to the size of the P6. On paper, the 1000:1 contrast ratio appears to be only average. 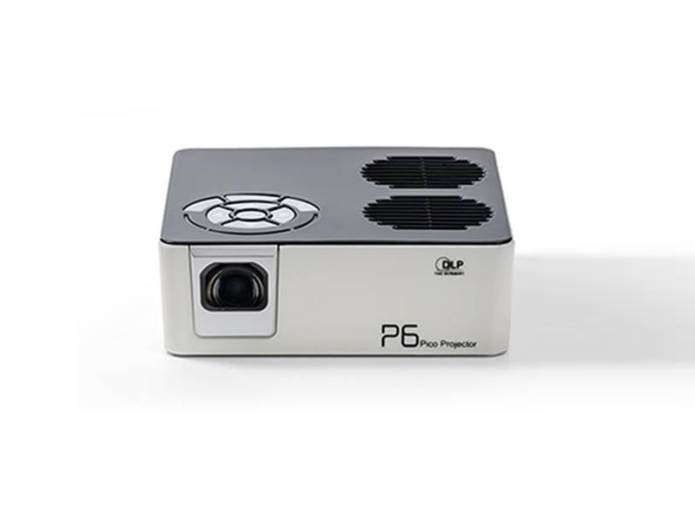 But compared to similar projectors, the P6 is in a league of its own. But there are some ways you can accidentally reduce the quality, and you’ll want to know about them. When you’re using a VGA connection to connect with the P6, you’ll find slight tint of discoloration appears in the image. The tint isn’t present if you switch to HDMI, or and is certainly eliminated when you’re using memory cards or USB connections. One more thing to note is how the gray balance of the P6 isn’t going to win any awards. If you’re not a videophile, you’re probably not going to notice this kind of detail. And it certainly won’t become a problem while watching movies. But when putting together a presentation, you may want to avoid using dark grays because certain grays are produced with a slightly purple tint. Vertical keystone correction allows you to get the image correct on your screen. Keystone correction is great for when you can’t get the correct lens-to-screen angle for a perfect image. It manipulates the image to get it looking as close to rectangular as possible, something which can be turned on or off through the remote. Keystone correction does have negative effects on your resolution, and can produce a variety of small screen artifacts. But for broadcasting in places where you don’t have optimal conditions for the projector, it’s great. 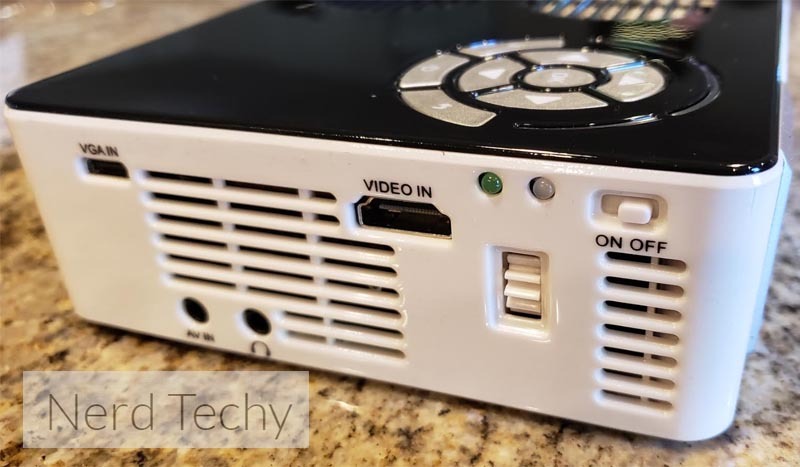 The AAXA P6 Mini Battery Powered Projector supporting keystone correction is one of its better features, though many people who are new to projectors don’t seem to notice. As its name suggests, the P6 is powered by batteries. 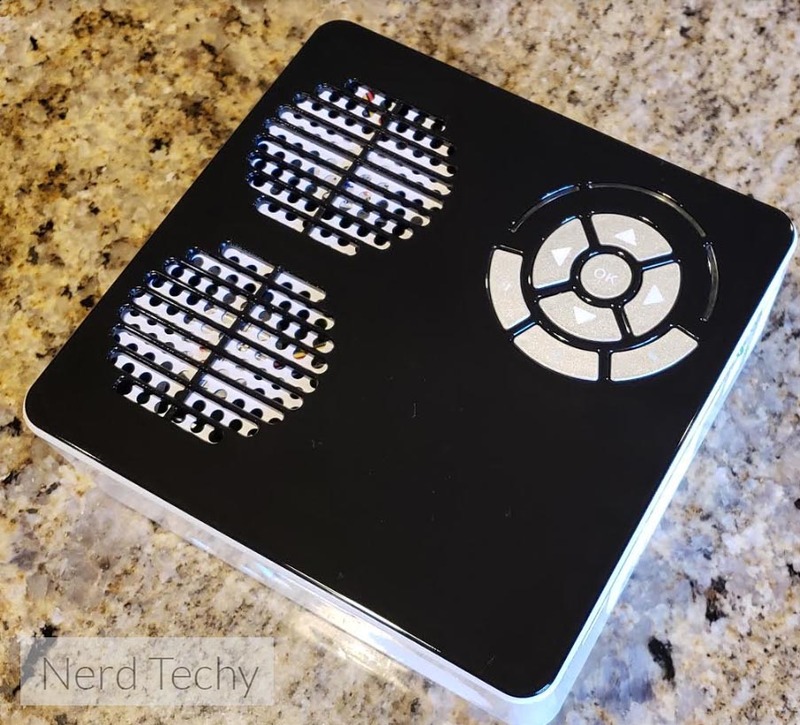 It runs off a reasonably strong 80-minute Lithium-ion battery, and that battery is charged with the included power adapter. The only thing to note here is how the battery can’t be charged while the P6 is in operation because it would be a safety hazard. But fortunately, the battery charges fairly rapidly. You can go from empty to full in well under an hour. The P6 supports a fairly wide range of connectivity options. You can use mini-HDMI, microSD, AUX out, AV, USB, and the onboard player. The onboard player is simplistic, but that’s part of its charm. You can quickly navigate through each menu to find exactly what you want rather quickly. Though AV junkies won’t find much in the way of highly advanced options. You will, however, find wide support for essentially every major media format. That includes wav, avi, ogg, wmv, bmp, jpg, gif, txt, mpeg, and a handful of others. No matter what content you’re trying to play or where you’re trying to play it, the P6 is ready to go. The one existing limitation you’ll want to note is how DRM videos do not have native support. DRM videos will consequently need to be converted in order for you to play them. Fortunately, the P6 is less restrictive when it comes to which types of devices it can connect to. 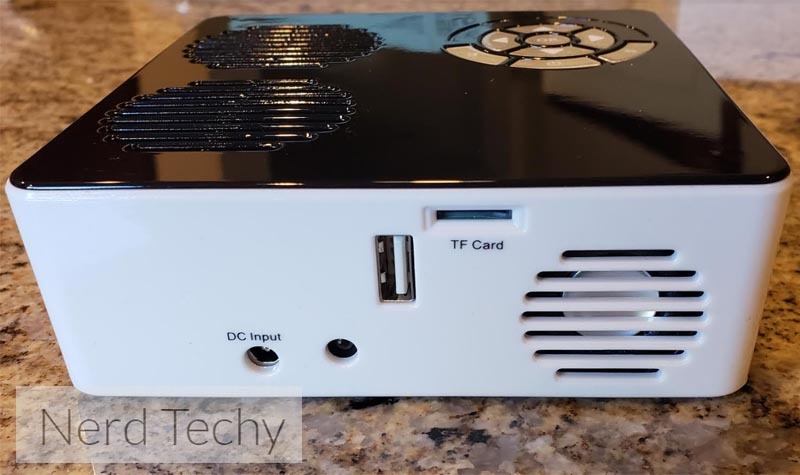 It’s fully compatible with HDMI devices like your iPhone or tablet, and essentially anything you might want to connect to the AAXA P6 can connect. But sometimes you’ll have to take extra steps to get there. For example, using an iPhone will require the use of Apple’s proprietary cables, while Android devices need an MHL cable. Setting up projectors can take time. You might have to run wires, make sure your content is prepared, and configure the screen to look appropriate to the surface you’re using. If one thing goes wrong, it can quickly become a hassle. And it’s always annoying when something that should take one step actually takes two steps. The AAXA P6 includes its own mini-tripod, which can help you quickly setup the P6 as you take it from one place to another. In many cases, you may not have to remove the P6 from its tripod at all as you move it from place to place. And the tripod is roughly 15” tall, giving the P6 a good boost off the ground. And while a heavy blow to the top of the P6 would still send it tumbling over, the stability of the included tripod can handle anything short of that. It’s got a smooth handled metallic build that’s clearly been engineered to safely distribute the center of gravity of the P6. The P6 also includes an IR remote that’s basically the same as any basic television remote, from its buttons to its performance limitations. With it, you can toggle between the various input modes, manage volume levels, and make adjustments to the picture. But because it’s an IR remote, you will need line of sight with the AAXA P6 while using it, like most television remotes. One more thing you might want to notice is AAXA is US based company. And they provide US based customer service to support their 1-year warranty. Who Should Choose the AAXA P6? Portable screens are great, but portability has a cost. And that cost isn’t entirely financial. Bigger machines are often bigger for a reason, and full-sized projectors are going to outperform the P6 in small but meaningful ways. If you don’t actually need the battery powered, portable nature of the P6, then you’re going to be better off choosing something like the AAXA M6. But what if you can actually use the portability of the P6? That being the case, you’ll have a hard time finding a more compelling projector in this price range. The P6 is just about small enough to hold in your hand, yet powerful enough to bring your favorite movies anywhere you can find a surface to broadcast on. Moreover, there are tons of ways to connect to the AAXA P6. From composite AV cables and VGA ports, to Amazon Fire TV and Micro TF cards, the only things missing are Wi-Fi and Bluetooth. The AAXA P6 has a battery life which lasts through about one movie, which is where it starts to feel less than perfect for home entertainment purposes. But for business meetings, class presentations, and various other on-the-go projects, the P6 is likely your best choice.